There is no such thing as personal space in India. You’re sharing a country with over one billion people - deal with it. The all too literal bump and grind is part of what makes this country what it is. It’s fascinating for me though to watch how people can be so oblivious to granting one another - and, well, me - even the slightest space. Take queues in India for example (the word ’queue’ in India means an orderly line of people who will break ranks in a headlong rush at the last moment, the discipline involved in standing still for so long ultimately proving too much) - standing in the line at the train station for a ticket will definitely mean being dry humped from the rear by an Indian guy who’s climbing over your shoulder to get closer to the window. And he’s only behind you because there are barriers to either side to prevent him from strolling past you, oblivious to your presence. Fortunately I’ve been blessed with peculiarly pointy elbows and I am not afraid to use them, so as I queue and there’s a guy behind practically panting like a dog in heat in my ear, it suddenly becomes urgent that I adjust the straps on my bag so that Fido behind me gets it in the solar plexus, which only deadens his ardour momentarily. And the closer you get to the ticket window, the more you resemble this with arms reaching over your shoulders and heads peeking through your arms and legs. That childlike excitement on Christmas Eve feeling overwhelms people here when the front of the queue is in sight. 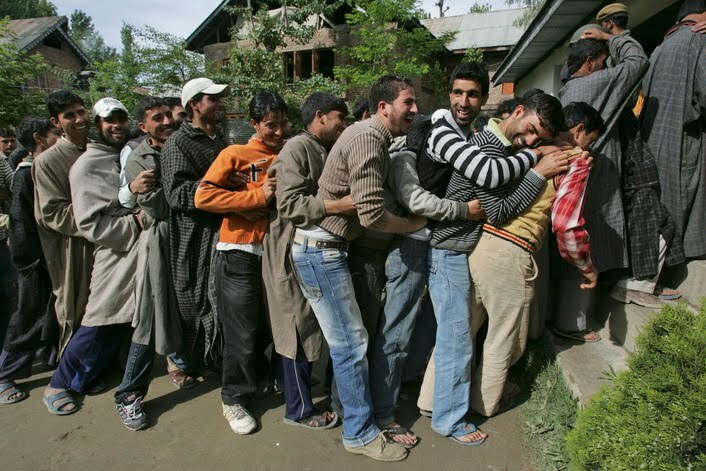 The other thing about Indian queues is that if you’re supposed to be standing in line and there are no barriers there to guide where you should be standing, just forget about it. Westerners are clearly invisible to Indians, who stroll past you just as you’re about to buy your stamp or ask when the next train to Kolkata isn’t leaving. If you get annoyed at this and express your anger to the teller, it won’t make any difference because, unfortunately, you’re invisible to the teller too. It’s a double bind. I went to the post office to buy some stamps today and there were four tellers behind the counters with not one other customer to be seen in the place. I stood before each of them in turn, making plenty of noise as I did, but all to no avail as they each ignored me. Finally a guy behind the counter who looked like he might be management shouted “What do you want?” in the same tone of voice you might expect from someone if they found you squatting on their toilet and reading the Indian Times. But best of all are the queues at the metro. There, the cosmetic process of actually standing in a line happens - the queuing equivalent of the sawing a lady in half trick. So by the platform you’ll see wonderfully ordered lines of seemingly patient people waiting for their train to arrive. And then when the train arrives, just like a dropped Coke bottle, as soon as the doors of the train open, chaos reigns, the lines break and it’s every man, woman and child for themselves. Everyone piles into the train before the passengers disembarking have had a chance to extricate themselves. Yup, very amusing to watch but no fun to caught up in when you’ve got a backpack on and you’re the one trying to get off. Mate you wont want to come home, sounds like you have had a ball and your trek just makes me jealous! Safe travels mate and a merry christmas to you, not sure where you will be on New Year but wherever it may be have a ball. My number 1 fans! Cheers Gaz, Happy New Year to all the Mcs from Jodhpur!